It lessens the feelings of depression. Loneliness can become an unwanted companion as one gets older. This is bad news. This often results in depression. According to the Mental Health America, over two million Americans aging 65 and above suffer from some form of depression. The cure for loneliness is companionship and pets can give that without asking anything in return. They even extend their company 24/7. You always feel assured that they will not leave you. 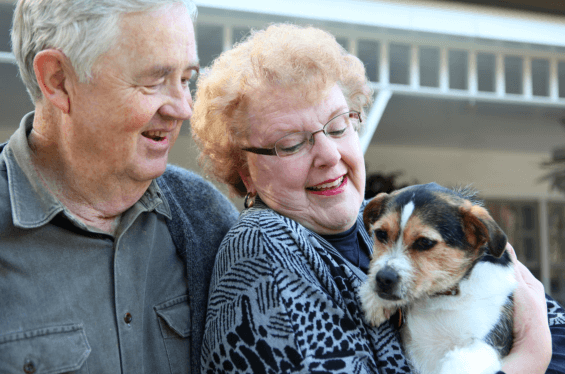 Moreover, having a pet also helps elders deal with grief and loss. It makes walking a routine. For older people who are still able to be active, having a dog can get them out of the house and move around. Walking is a great form of exercise, no matter what age a person belongs to. However, getting into a regular exercise routine is difficult to maintain. Having a pet can help you with it. For instance, a dog requires to be taken outside for a daily walk. Of course, you cannot just leave them walking by themselves. You have to accompany them. Thus, you can also benefit from it. According to the American Heart Association, people who own dogs can lower blood pressure and cholesterol. This is due to the fact that people who own dogs get more exercise from walking their dogs. As said earlier, dogs need to be walked daily. This is a great excuse to get out of the house and socialize with the people you meet. This enables you to meet other dog owners who are also giving their dogs a walk. This helps build close relationships with others. Studies have shown that elders who have pets are less likely to exhibit stress than those who do not own one. This may be due to the regular walks or because of the companionship they provide. It offers a sense of purpose. Elders need a sense of purpose. They want to feel their worth despite their old age. Elders do not have a job or a kid to take care of. This makes them question their value. Taking care of another living them makes you overcome any feelings of unworthiness. Also, taking care of another living thing is a satisfying experience. Abundant Life Assisted Services, a senior home care services in Georgia, provides for a high-quality in-home elderly care. Our services also include dog walking. For more helpful tips, you can visit our website at www.alascare.com. You can also reach us at 678-319-0307 or e-mail us at info@alascare.com. This entry was posted in Elder Care and tagged Mental Health, Pet Therapy. Bookmark the permalink.